As previously reported (with a photo from an anonymous contributor), ALDI has opened at the Shoppes at Livingston Circle, in a space that previously housed a Fresh Market. 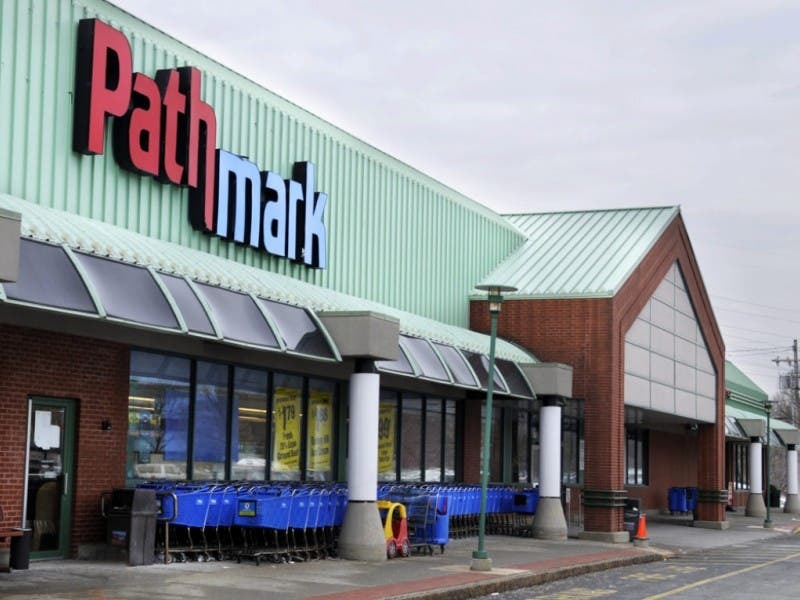 Prior to that, the space along with about 25,000 square feet of additional space was occupied by Pathmark (closed 2011) and Grand Union (2001). Here's a look at the monument sign facing NJ-10 towards the Livingston Circle. Nice bold ALDI lettering there, although I'm surprised they didn't work in the yellow-orange color. They can put whatever they want on the sign, but I'll always remember it as The Village at Livingston anchored by Pathmark! The facade has not been significantly altered since it was The Fresh Market, which is likely due to restrictions by the landlord. It certainly does not have the standard ALDI appearance. The Pathmark took up the entire row we see here. You can see what the Pathmark looked like here. Produce lines the first aisle, with baked goods next and dairy on the back wall. Meats and frozen foods are on the far side. As you can see, there is a lot of space in the store -- possibly too much. You enter to the left of the half-wall, the other side being a bagging platform. A look down the first aisle. Produce, as in many supermarkets, also takes up an island between the first and second aisles. Very nice selection of baked goods along the first aisle, including more specialty items like brioche bagels or cinnamon French toast bagels. Additional grocery items near the back of the first aisle. Notice that several of the department/directional signs on the wall are backlit. A look across the back of the store showing dairy. As you can see again, there is a lot of space around here, and the back aisle is possibly too wide. Moving back towards the front of the store, here's a look at the produce island in the first two aisles. The second-to-last aisle looking towards the back of the store. We can see more lit department signs and another nice wood-backed "Guaranteed Quality" sign. Cheese and deli items in the back corner. Looking along the expansive back aisle. It doesn't help that I visited the store on a weekday early afternoon, not exactly peak grocery shopping time. Meat at the back of the last aisle, with frozen foods in the front. Frozen meat and seafood line the side wall near the front of the store. Manager's office is just in front of the frozen cases. Notice also that the frozen food cases are built into the wall rather than placed in front of it, meaning that they are stocked from behind. A look at the front-end along with some additional freezer cases. The store has a lot to offer, but maybe not enough for the space that it has. I have no doubt, though, that ALDI will survive unlike Grand Union, Pathmark, and The Fresh Market because it actually is a different type of store! The location is 277 Eisenhower Pkwy, Livingston, NJ.